The change in the intergovernmental agreement with Walton County expanding the opportunity for citizen appointments is on the consent agenda for Tuesday night’s meeting, meaning it will be approved without further discussion unless a commissioner objects. Commissioner John Daniell made a case at last Tuesday night’s meeting for quick action on appointment of a citizen. The agenda for Tuesday night includes discussion of that option. Appointment of citizen to the Management Board will require the commissioners to set aside at least one of the appointments they made on Feb. 12 when the BOC followed Chairman Melvin Davis’ lead and removed former commissioner Chuck Horton from the Management Board. Horton could have continued to serve as a citizen representative even under the terms of the intergovernmental agreement now in place. Horton left the Commission at the end of last year after unsuccessfully challenging Davis for the chairmanship. The existing intergovernmental agreement allows a citizen to serve as a voting member but not as an alternate, and Horton had been serving as a voting member since October of 2011. That was when he replaced citizen Hank Huckaby, who resigned after he was named chancellor of the University System of Georgia. 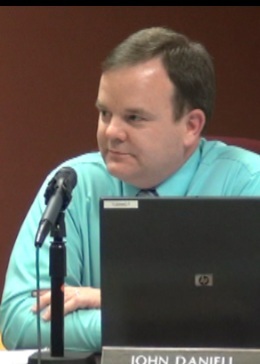 Oconee County has not had a citizen on the Management Board since that time. The change the BOC will consider on Tuesday will allow citizens to serve as one of the county’s three voting members and as alternates. At present, alternates must be either commissioners or county employees. In principle, the new procedures will allow the BOC to appoint citizens to two of the three voting spots and to all three of the alternate slots, though it has never appointed more than one citizen to the Management Board. At least one of the Oconee County members of the Management Board must be a commissioner. Davis proposed to the BOC on Jan. 29 that newly elected BOC member Mark Saxon replace Horton on the Hard Labor Creek Management Board, though his recommendation was that Saxon first serve as an alternate for six months until he learned more about the project. In the meantime, Chris Thomas, Utility Department director and a current alternate, was to serve as the voting delegate. The BOC made these appointments on Feb. 12. The Board also reappointed Commissioner Jim Luke and county Finance Director Jeff Benko as voting members of the Management Board and extended the terms for all six appointments to Dec. 31, 2014. Davis had proposed a more radical change in the intergovernmental agreement to give himself the ability to appointment himself or someone of his choosing to the Management Board, and that proposal was at the center of discussion between Commissioner Daniell and Davis at the BOC meeting on Tuesday night. The Management Board, chaired by Commissioner Luke, refused at its meeting on Feb. 19 to go along with Davis’ initiative. Davis has sought to be a member of the Management Board from it inception, but a majority of the other four commissioners wanted the full commission to appoint all Management Board members. Davis said on Tuesday night that he didn’t think a citizen should be a voting member because of the importance of the assignment, but he said he thought it would be acceptable to have a citizen serve as a non-voting alternate. At the beginning of the discussion on Tuesday night, Davis read the version of the change to the intergovernmental agreement approved by Management Board and asked for comment. Commissioner Luke reiterated that the version Davis had read had been approved by the Management Board, but he said that approval was merely a recommendation and that the BOC now had to act. Daniell said he was “puzzled by why there was a second version” and wondered what kind of discussion had taken place about it. Davis said he had first discussed it with Kevin Little, chairman of the Walton County BOC and a member of the Management Board by virtue of his office. The four members of the Management Board from Walton County are determined by a procedure approved by that county’s commissioners when the intergovernmental agreement was signed in 2007. Davis said he next discussed his proposal with Commissioner Luke and Commissioner Saxon. Davis said Tuesday he didn’t want to discuss his proposal and wanted to discuss the one before the BOC for action. Luke confirmed in a telephone conversation on Wednesday that he had talked to Davis by telephone on the morning of Feb. 19 but that he first saw Davis’ proposal when Hard Labor Creek Management Board Attorney Chris Atkinson sent it to him that same morning. I called Atkinson on Friday to get additional background on the document, but he said he would not comment because of the attorney-client relationship he has with the Management Board. Early Friday morning I had sent an email message to Oconee County Attorney Daniel Haygood asking him if I could talk with him during the day. Haygood replied that he was out of town until Monday. The message indicated it was sent from his iPad. After I talked with Atkinson I sent another message to Haygood asking him if he was involved in drafting the alternate document for Chairman Davis. I haven’t heard back from Haygood. After I talked with Atkinson, I also called Davis’ office. His assistant, Kathy Hayes, told me Chairman Davis was out of the office but in contact through his email. I immediately sent Davis a message asking him if he would tell me “who drafted the alternate resolution.” I have not heard from Davis. The Tuesday night agenda of the Board of Commissioners indicates that the group also will discuss establishment of an Oconee County Farmland Protection Committee. Formation of such a committee is the outgrowth of discussion by the commissioners at their “visioning” session on Jan. 24. Some members of the commission said that funding for farmland protection, approved by the voters in the 2009 Special Purpose Local Option Sales Tax vote, isn’t being handled in a way that is obvious to the citizens. Several proposed that a new citizen committee advise the Commission on the program. The Commission meeting starts at 7 p.m. and is to be held in the courthouse in Watkinsville. Thank you for your effort you put forth to keep us informed.